Never been to an RSMT Show? Well,Here are some links to past photos and some things that have been said about the shows. Hi M & M - I just saw "Scrooge" last night and a few months ago, "Oliver! "...both shows were magical! I even went back the next night to see "Oliver!" again, and would go again today to see "Scrooge" again, if it was possible! The whole cast was just superb!! I'll be back for many shows to come, and am even thinking of... auditioning in the future. Bravo! of the better of the community theater experiences I've been to. 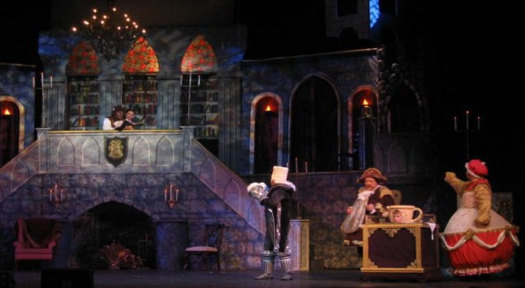 about it on your page--it was definitely worth the hr+ drive"
Superb is not adequate to describe the sense of beauty, excitment, and exhileration we experienced at "Beauty and the Beast" on Saturday night. the opening scene in the village was breathtakingly beautiful. The costumes overwhelmed us. The colors and styles of all the beautiful dresses and the backdrop were awesome. Then we went to the castle and I was blown away by the magnificence of the set. I applauded and finally got several other people to clap with me and realize the monumental achievement in set design they were looking at. All the music, choreography, lighting, the superb singing and especially the technical work were outstanding. The casting was superb and the specialty costumes were magnificent. Once again Ross has set a new standard for community theater in our area. This show was as good as any I've seen in New York and better than many I've seen in Chicago for much more money. Congratulations on creating a wonderful evening of superb theater. NO SEAT SHOULD BE EMPTY AT THIS SHOW! IT IS A M A Z I N G ! 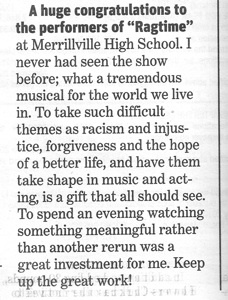 After 38 years of teaching/directing/watching theatre -- in NYC, Chicago, and all around NWI, "RAGTIME" is one of the finest performances I have ever seen! [I do not say that lightly - EVER.] DO NOT miss this show next weekend. I was Blown away..... I am bringing friends next week. I have never seen Community theatre like this before. I laughed, I Cried, I believed every performance. For only 10.00 I will be back to see this one again. From the Post Tribune a Quicly Reader wrote this.